I was watching the numbers come in on the DX lens survey in real time for a few hours yesterday. Very early on trends were clear, and the final results stuck to those trends all the way through nearly 6000 votes, when I closed the poll*. Make it a zoom. While a lot of you say that you’re interested in more DX primes, when push came to shove, the first four positions were all occupied by zooms. In particular, the 10-16mm f/4, 50-135mm f/2.8, 16-50mm f/2, and 17-50mm f/2.8 replacement with VR. In other words, this is essentially the FX zoom trio downsized in some way. Not too wide. In the prime area, I noted a trend in the five through eighth positions on your buying list: 24mm f/2.8 pancake first (35mm equivalent), 16mm f/2 or faster next (24mm equivalent), and 12mm f/2.8 or faster after a bit of a drop off (18mm equivalent). Support for everything. I had expected there to be a bit more distance between first and last place on the list. But it seems that there was not a super clear winner that stood out, nor was there really a candidate that didn’t have a block of supporters. Curiously, the two normal lenses (35mm, or 50mm equivalent) fell at the bottom of the pack. I guess the mid-range zooms and the current 35mm f/1.8 have suppressed that demand. Since we have a pro DX body back now, and two extremely capable DX bodies in the D7200 and D500 pair, let me tell you what I’d want out of the list and why. I need a zoom trio to take me from wide to telephoto. That would be a 12-24mm f/4 replacement, the current 16-80mm f/2.8-4, and a 50-135mm f/2.8 if it’s small enough, otherwise a 50-135mm f/4. Why these lenses? Because at DX my personal goal would to be minimize the size of a very competent kit, and I do like a bit of overlap on focal lengths as it minimizes how often I’m swapping lenses. I’d worry that a 10-16mm f/2.8 and 16-50mm f/2, while grabbing back the stop of light DX gives up to FX, start to just be too big to justify going with the smaller body in the first place. From there, the question is what primes am I missing? With the 20 to 85mm f/1.8 prime set for FX, we already have a number of focal lengths that are well covered with reasonably small lenses. But we’re stuck at 30mm equivalent for the wide end. Thus, I’d probably pick up one or two of the 12mm, 14mm, and 16mm offerings I suggested. For other primes, I’d stick with the current f/1.8 set I’ve already got. I suggested fourteen DX lenses Nikon might produce. Of those, two were direct replacements for something already in the lineup. Another (58mm f/1.8) actually has things nearly equivalent in the lineup (50mm f/1.8 or 58mm f/1.4). Two were variations on another (the 50-135mm twins, the 35mm primes). A couple are stretch cases (16-50mm f/2, the tilt shift lens). Others have third-party substitutes (10-16mm f/4 or faster). So I suppose that you could say Nikon should make these lenses first to get quick satisfaction among DX users (and in this order): 50-135mm f/2.8, 24mm f/2.8 pancake, 16mm f/2 (or faster), 12mm f/2.8 (or faster). Four lenses. That would satisfy over a third of you right there. Wait, that’s not quite right: that would produce over a third of the purchases in the lens list I presented. 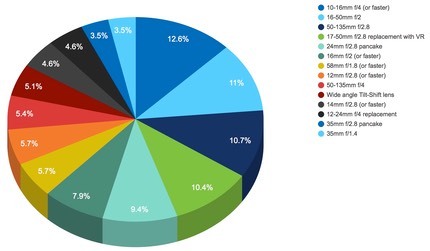 And yet, here we are in Year 17 of DX and I can describe twelve missing lenses that a fairly large population say they would purchase if they existed. How could Nikon have missed that? Oh, right, their whole aversion to cannibalizing their own sales. And yet, I was careful not to specify any lens that would arguably be better for DX than existing lenses are for FX. Almost the opposite: For the most part, I let the one stop differential play out in my list (the exception being the 16-50mm f/2). 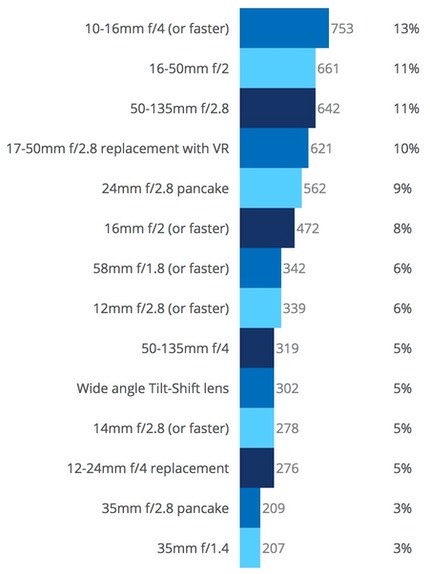 In other words, this list of lenses, if produced, wouldn't truly cannibalize anything. As I noted in my article on why Nikon need to produce a D300s followup, the real thing Nikon needed to do is make DX so that it’s an affordable step before FX. They’ve only partially done that, and mostly only in bodies. So once again I implore Nikon to get off their (gl)asses and produce a fuller line of DX lenses. * Why did I cut off the survey early? Because I wanted to minimize the impacts of people forwarding the survey to others to respond to.